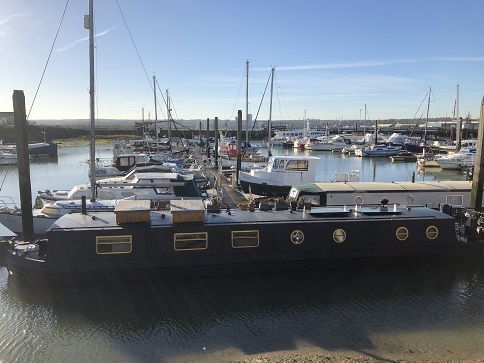 Premier Houseboats are pleased to present Bigger Blue, a fully cruising widebeam narrowboat that can be used as a static home, continuous cruising home or something inbetween. Originally built in 2004, she was not launched until 2016. Bigger Blue is reluctantly offered for sale due to a change of circumstances, as is now moored at Port Werburgh on a secure residential mooring. Bigger Blue comes fully equipped and ready to move into, and has had a full out of the water survey in October 2018 which is available upon request. The boat has been recently blacked, and comes with solar panels, external storage units and a smart TV. The engines and generators are in good working order. Bigger Blue comes fully furnished, and its decor is modern, with more than a nod to a classic fit out. It has full Eberspaecher central heating which can be put on a timer or even controlled remotely by a phone app, and to compliment this there is a 6kw log burning stove which is a lovely focal point of the main living area. Bigger Blue offers a large double cabin with lots of storage and double bed. A door leads to the shower room, which has a large shower cubicle, toilet, hand basin and again plenty of storage. Through another door is the main living area, an open plan area with an extremely light and spacious feel. the kitchen area has ample work surface and storage, with a country cottage feel to its design. There is a gas oven and hob, and a fridge freezer compartment. The main lounge area comes with a large corner/sofa bed, dresser and coffee table. This is a great size to enjoy life afloat, and has double doors leading to a small outside area, which would be especially nice to utilise during the warmer summer months. There are plenty of windows throughout, a good mix of square windows and portholes. Bigger Blue is competitively priced for a speedy sale, and together with its secure residential mooring, offers an affordable opportunity to live afloat. Bigger Blue is also available without the residential mooring if it is not required. Vessel name: Bigger Blue Vessel condition: Good Vessel type: Widebeam Narrowboat Builder: West End Marine Make: West End Marine Model: 60 Wide Beam Year constructed: 2004 Year refitted: 2016 HIN: GB-WEM4611ZF404 Registry: SSR 166438 Berths: 2 Cabins: 1 Heads: 1 No. of engines: 1 Engine model: Perkins 2.6 ltr Fuel type: Diesel Length over all: 60' Beam: 10' Maximum draft: 1' 6" Hull material: Steel Hull type: Flat Fuel capacity: 300 Litres Water capacity: 500 Litres Holding tank capacity: 260 Litres Disclaimer Premier Houseboats offers the details of this advert in good faith as it was presented by the seller or his representative but cannot guarantee or warrant the accuracy of this information nor warrant the condition of the described item within this advert. A buyer should instruct his agents, or his surveyors, to investigate such details as the buyer desires validated. The Item described within this advert is offered subject to prior sale, price change, or withdrawal without notice.